We do it all the time. In fact story writers pretty much count on it. When we read a story we identify with a character in the story. Sometimes we even read ourselves into the story as one of the characters. It is nobody’s fault; it is just how we humans seem to operate. We look at the characters and the story and try to make sense of it by who we are and the experiences of our own lives. But we can’t do that with the parables of Jesus. Because if we try putting ourselves in the parable and try to make sense of it with the experiences of our own lives, you will end up focusing on the wrong thing and miss the point of the parable– we will end up focusing on the sinful people and what they are doing. Jesus is not telling you what to do, but proclaiming the great things God has done for you. Therefore, as we look at today’s parable, we don’t focus on the wedding guests, even though we’ll get to them. No, this parable is about the king. It’s a simple story, and you’d think it would stay that way. The king has arranged a marriage for his son, and he is sparing no expense for the festivities. He sends out the invitations to those whose company he desires—and who is going to say no? This is the king! At worse, you accept it because you want to make sure the king knows you showed up. At best—and this is a really good “at best”, this is going to be the celebration of the year. There will be food and drink in abundance. Everything is going to be perfect. You don’t want to miss THIS party. But the guests who were invited don’t want to come. Ever the gracious host, the king sends out servants to invite them personally: “All the work has been done, and all things are ready! It’s all free for you! Come to the wedding feast of my son!” Once again, who would say no? You’d have to be blind, hostile to the king to skip this invitation. Yet some decline his invitation, saying things like they must keep working on the farm or at the business: crazy, but some people prefer to muck out the cattle stalls than to spend a day with the king. And this is where the story takes a really ugly twist: rather than say no to the servants, some seize them, treat them terribly and kill them. The king invited them to a party in goodwill, and they RSVP with the blood of his servants. Such evil must be dealt with, so it should come as no surprise that the king sends out his army against his subjects who want nothing to do with him and he destroys those who killed the messengers of good news,. But what now? The plans are already set. The marriage has been arranged and declared, and the king will not go back on his word. Even though the guest list proved hostile, he will still have guests at his son’s wedding. He says to his servants, “The wedding feast is ready, but those invited were not worthy. Go to the main roads and invite to the wedding feast as many as you find.” The servants go out and find whoever they can. It is, no doubt, a motley crew—not the sort of people who you’d normally find in the king’s dinning hall. They often have lower incomes, their houses are in need of repair, some are held back by one problem or another, and some, well some might even have checkered pasts. Nevertheless, the servants extend the king’s invitation, and the wedding hall is packed with guests. They would be a pretty scruffy looking lot by most kingly standards, maybe even laughable to the king’s enemies, but the king takes care of everything. As goes the custom of such weddings in Jesus’ time, the king gives each guest a wedding garment to wear. This is his son’s wedding, and he spares no expense. Whoever received his invitation and came to the wedding receives clothing, food and drink—all by the king’s doing. Once they’re in the feast, they’ll all look like the king’s own children, because the king provides all. And yet, Jesus says, when the king surveys the wedding hall, there is one man who has rejected wearing a wedding garment. Please note: this is not a matter of poverty on his part, because the king has provided clothes for each guest. Rather, the guest has said, “I will go to the king’s hall, but only on my terms; I’ll go just as I am.” His appearance is a sign of disrespect to spite the king, and the king does not take the offense lightly. “Friend,” he says, “how did you get in here without a wedding garment?” And when the man has no response, the king commands his servants, “’Bind him hand and foot and cast him into the outer darkness. In that place there will be weeping and gnashing of teeth.” It is an honor to be in the presence of the king, and certain decorum is required; it is a great pity that the man is unprepared, since the king sought to give him everything he needed. But if he does not desire to be the king’s guest, then he has no place at the wedding. It seems odd, but the king will come under attack. He will be criticized for destroying the first set of guests, even though they killed his servants who came with good news. The headlines will be all about how he throws out the one guest into darkness, even though it was the man’s own fault. In fact, while many notice such aspects of the parable, they’ll miss the amazing, wonderful point: the wedding hall is packed full of people who had no idea they would be guests of the king. If you’re one of the guests who scoffed at the king’s generosity, then you’re not going to like this story. But if you started out as a commoner on the byways, this parable has a very happy ending. When the day began, you were a nobody out there somewhere. Now, the king has given you all good things. And as long as this feast lasts, you are the king’s people, members of his household. And here’s some more good news: the feast is going to last forever. Remember, this parable is about the kingdom of heaven. In Revelation 19, heaven is called the “marriage of the Lamb” (v. 7): it’s a wedding feast! 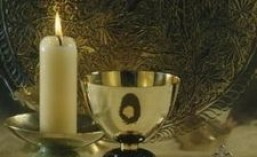 And the Lord goes on to say, “Blessed are those who are called to the marriage supper of the Lamb!” (Rev. 19:9). Here is your reason to rejoice, today and always: the Lord has called you to that marriage supper. He has done all that is necessary to prepare it. Rather than kill the fatted cattle for a fine BBQ and some terrific steaks, He sacrificed His own Son the very Lamb of God: the Son must die for the bride to be redeemed. He has also raised His Son, Jesus Christ, from the dead: and so all is prepared for the wedding supper. The marriage feast will happen. You know what happened. Time and time again, the people refused the invitation. When the Lord continued to send prophets to call them to the wedding feast, they began to beat them, persecute them, scorn them…kill them. Eventually, the Lord had enough. He allowed first the Assyrians, then the Babylonians, to conquer, capture, and carry-off the children of Israel. If people did not want His help and protection, He would not force them to be safe. Because they rejected Him and killed His messengers, they and their cities were destroyed. The Lord still faithfully sends out His messengers today: not just to Israel, but to all nations. Around the world, pastors publicly preach, in the stead and by the command of Jesus, the Good News that all are invited to the feast of heaven for Jesus’ sake. All around the world, Christians share the Gospel as they have opportunity. All around the world, the Holy Spirit works by that Word. People hear and believe by the Spirit’s work, and so they are numbered among the wedding guests for eternity. But…many also do not believe. In fact, many seek to persecute the Church for the message of Jesus. Insulated and protected as we are, it is difficult to believe that Christians suffer, and suffer terribly, for proclaiming the Gospel. Houses are lost, children are kidnapped and Christians are killed for the faith. The king’s messengers still die for inviting people to the feast. In America, we are still quite safe, perhaps suffering a snub in the neighborhood or the loss of a job for our faith. But should you witness such trouble or be its victim, the devil will use it to turn the screws. He will seek to convince you to abandon Christ, lest you suffer hardship for the faith. When you are tempted to give up or give in, or to be enticed away, denounce Satan, for he is the one who tries to rob us of our faith and our church. When you are tempted to moderate your faith to avoid trouble in this world, confess the sin and be forgiven. For the sake of Christ, the eternal feast is yours. As you go about your life, beware of one more temptation—it is the temptation of the guest without wedding clothes. When the Lord invites you to the wedding, He gives you all good things. By His Word, He gives you the faith to believe and thus He transforms you into His own. By Holy Baptism, He clothes you with Christ and His righteousness (Gal. 3:27); by water and the Word, you are prepared and robed for the wedding. By His Holy Supper, He keeps you fed and nourished until the marriage feast of the Lamb in heaven; and indeed, each Holy Communion is a foretaste of the feast to come. Jesus is present here though unseen, He has gathered you here at Emmaus to meet Him in His Word of forgiveness, to be washed in the water of Holy Baptism, and to be strengthened and renewed by His body and blood in bread and wine. In heaven, we will stand in the glorious presence of the risen Savior, and the feast will go on forever. The Old Adam that speaks so convincingly to each of us will always tempt you to believe that heaven is yours because you have done enough good, or haven’t done enough bad to be kept out, or you’ve been doing better than others and so God should cut you a break. No matter how you slice it, such temptations say that you go to the wedding by your own efforts. They say that your righteous works are proper attire to wear in the presence of God. Therefore, heed the Word of the Lord from Isaiah: our works are not glorious before God! “We are all like an unclean thing, and all our righteousness are like filthy rags” (Is. 64:6). It is sin to wear the clothes of your own righteousness to the eternal feast for your own efforts are filthy. When we start counting our works as righteousness, when we count a moral and upright life as our justification before God, we snub the Savior who died to clothe us with His righteousness. And on the last day, the day of the wedding feast, all those wearing their own righteousness before the King will be cast out into outer darkness, where there is weeping and gnashing of teeth. That is why you rejoice daily to confess your sins and rid yourself of filthy rags; and that is why you daily rejoice in the forgiveness of Christ, who clothes you with righteousness for the wedding day. This is the Good News: you have a place at the marriage feast of the Lamb, and the feast will last forever. Here’s more Good News: you’re not just a guest of the King. You have married into the family—WE ARE THE BRIDE! St. Paul writes in Ephesians 5, “Christ also loved the church and gave Himself for her, that He might sanctify and cleanse her with the washing of water by the word, that He might present her to Himself a glorious church, not having spot or wrinkle or any such thing, but that she should be holy and without blemish” (Eph. 5:25-27). It would be more than a blessing to be a doorkeeper in the house of the Lord, but that is not the Lord’s plan for you. You are not a wedding guest, but God loves you so much that He has gathered you together as the bride of His Son, and He has cleansed and prepared you, made you pure and holy by Christ’s own holy, precious blood, and His bitter suffering and death. You’re not just invited to an everlasting marriage feast. You’re invited to your wedding, where you are united with Your Savior forever. In Christ, your Bridegroom, yours is not an eternity of outer darkness, weeping and the gnashing of teeth. In Christ, the banquet feast of heaven is yours, for He has made it so: for you are forgiven for all of your sins, in the name of the Father and + of the Son and of the Holy Ghost. Amen. This entry was posted in Sermon and tagged Matthew 22. Bookmark the permalink. Thanks Benoit. I wish I could return the favor, but sadly I do not know French.